We’re there with you all the way. 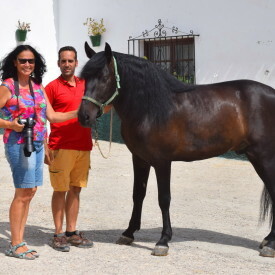 Carola’s chapter in Spain began in 1998 with her own riding and breeding business and, since then, many strong relationships have formed between her and horse breeders, trainers, dressage and show riders as well as many individual horse lovers. With her husband Jan, she now leads her business without a stable and is always on the go to view and test new horses and to assist her guests in every way she can. The happiness of her guests always takes priority, whether it concerns the guests rooms in the Finca la Alqueria, the preparing and planning of the trip to Spain or recommendations for leisure activities. She also handles the horse transports, the processing of the relevant documents and the veterinary reports with great care and she is in direct contact with the Ancce (PRE breeding society). In other words, Carola embodies the Central processing Unit of the business, both online and “offline”. She spends a lot of time on the phone, in the current languages (German, English, Spanish, French), but the easiest way to reach her is via email. Not least, she also ensures to keep the website as up-to-date as possible and is always thankful for suggestions. Hobbies: Piano, Yoga, cooking, mother of 3 children. 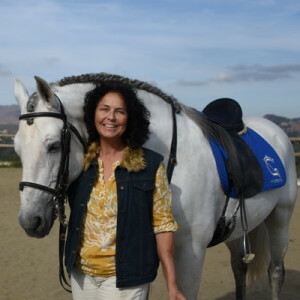 Jan has been tied to our business for many years, starting out as a guide for riding excursions. 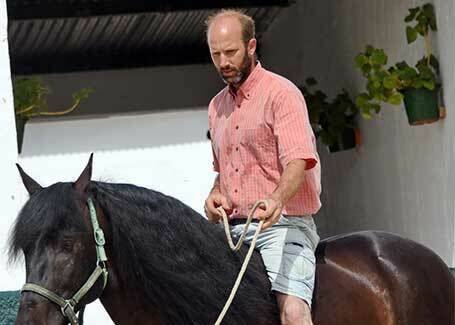 He has profound and intuitive knowledge of horses, ranging from their temperamental qualities to their functionality. He has been involved with horses since his childhood, most notably through the vaulting sport, and over the many years in our breeding business his responsibilities became as elaborate as they became specialized, ranging from caring for the mares, stallions and foals to shoeing their hooves, loading and unloading the horse trailers, breaking in and training the young horses as well as providing direct and emergency medical care. Alongside his professions as a farrier, he is a valuable member of the team as partner, advisor and companion. Hobbies: bee keeper (own honey! ), technical scuba diving, paragliding, Dad.